PRESS RELEASE: The Falcon's exclusive hollow inox steel driveshaft offers the utmost in strength without adding unwanted drag or excess weight. This increases the smooth operation of the pedal and gives Falcon a sensationally smooth feel. By allowing the torque-free spring mechanism to move independently the Falcon's stroke and recoil motions are exceptionally smooth and feel more natural to the foot. "Every feature and adjustment has been engineered to make Falcon feel as if it's an extension of your foot," said Joe Hibbs, R&D Manager at Mapex USA. "Every artist that has tested this pedal has been able to fine tune it to their liking within minutes — right out of the box. Falcon is a pedal for the people. This is a pedal that can satisfy virtually every drummer." Because the Falcon's footprint is more compact than other bass drum pedals, it's easy to comfortably position between the hi-hat and snare stands. The Falcon's easy-to-reach, resistance-free Talon clamp adjustment can be tightened with one hand from a seated position, making setup quick and easy, even in the tightest spaces. The Falcon is equipped with interchangeable cams to suit each player's individual style. The "Glide" cam offers an equal amount of inertia from the beginning to the end of the stroke, while the "Pursuit" cam is recommended for increased power and maximum impact. The reversible beater head comes with interchangeable 10 gram and 20 gram inserts. By choosing one of these weights (or playing without any additional weight at all) the player can choose the desired degree of centrifugal force. 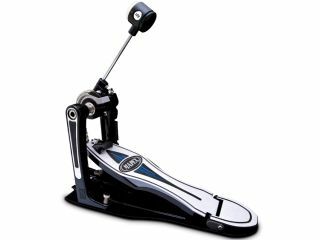 The MSRP for the Falcon Single Pedal is $329.00 The Falcon Double Pedal carries an MSRP of $649.00. Both will be introduced to dealers at the 2010 Winter NAMM show and will be available by January 31, 2010.